I have been collecting Cal Ripken, Jr. cards since the early 90's and have seen nearly everything there is to see at this point. However, I had always wondered about the autographed cards at the bottom of the SCD listings for the 1993 U.S. Playing Card Aces set. In 20 years, I had never seen any of the four players available for sale. I'm sure they were out there, but I never saw them and never heard anything about them. As my collection grew, it seemed harder and harder to find items I had never seen before. I have found the 1990 Donruss Blue/White Test Issue, 1990 Donruss Aqueous, 1992 Donruss Diamond Kings Supers, and other unusual test cards. But probably the most interesting story about Ripken cards in the last decade started at freedomcardboard.com by a user known as "esaslo". esaslo had enjoyed the forum for some time and one night mentioned he and a friend had been wanting to play some cards, so he broke out his deck of 1993 Aces and found an unusual card. He found the elusive Ripken autograph! He reported his find on the message boards and the interest reached epic levels. He said he had been offered $4,000 for the card. Then it became $6,500 on the condition the card grade a BGS 9. The stipulations for this arrangement were very interesting. Should another example of this card surface within three years time, he was required to refund $4,500 of the purchase price. In addition, he wrote into the agreement the right to repurchase the card in the next three years for $10,000! Sadly, the card graded a BGS 8.5 and the deal fell through and the card never sold, until now. I found the card esaslo was touting as the $6,500 - $10,000 card on eBay. I was naturally skeptical and figured it was someone who stole the scan and was trying to make some quick cash. I inquired further and found out esaslo had actually passed away and his mother was selling the card. I purchased the card and still have it. I recently purchased another of the 3 known copies. When I received esaslo's card in the mail, I felt a little sad. He had drummed up all this interest and never realized any of it. He never will know that I got PSA to officially recognize this card and grade it. He will never know that it is ranked as one of the most treasured sports cards in my collection. It also made me sad to realize that when it is all said and done, we can't take our cardboard with us. Ultimately, it fades away into someone's else collection or is lost altogether. The things we value in this life are just that, things. I'm happy to have my family. I hope esaslo had as much or more in his life. Elmer P. Saslo III, 29, Fairfax, Va., died suddenly after a seizure while visiting in Peckville, Pa., on Friday, March 30, 2012. Born in Scranton, he was the son of Elmer and Jean (Mamera) Saslo Jr., Orlando, Fla., the brother of Tami Rose, and the grandson of the late George and Beatrice (Pilch) Mamera, and Elmer and Isabelle (Osborne) Saslo. His girlfriend was Amy and his best friend was Melissa. He also cherished his two kittens. He was the Executive Vice-President and Director of Information Technology at Corporate Sport Incentives in Fairfax, Va., since 2002. He attended high school for two years at Oak Ridge High School and Edgewater High School, Orlando, Fla., in the Science, Engineering and Technology magnet program, and Valencia Community College in dual enrollment. He was the recipient of many, many science awards, the Army and Navy Awards, and the Orange County Garden Club's University of Florida's summer scholarships, which were awarded to less than the top 1% of all junior or senior students, approximately 30 per year, in the State of Florida. 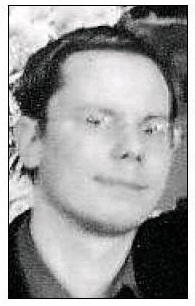 He was the recipient of a full academic Florida Bright Futures Scholarship to any college in the State of Florida, but he chose instead the George Washington University Alumni Scholarship, graduating from George Washington University in 2002 with a Bachelor of Science in Applied Mathematics with a focus on computational programming dynamics, cryptography. He also directed the Kidsnewsroom.org website in Washington, D.C., for several years. He worked diligently with then-Florida Governor Jeb Bush's office, the Dept. of Education, and various teachers to clean out corruption in the Orange county School District in 1999, paving a pathway to make things better for students who came after. He was a supporter for online education in the classroom under that administration. He was the main supporter for his grandmother, both financially and emotionally, over the last seven years, and helped other people financially who were in need throughout his life. Most recently, his incentive ideas were adopted by Ebay. His job took him to many places throughout the country and many event venues, which his dad accompanied him sometimes. He accomplished many, many good things in his life that only others dream about. He was also an honorary member of the Liberty Fire Department No. 6, Olyphant, Pa. He was an extremely brilliant, personable, caring and loving individual. He cherished his close friends and his family. He was a supporter of the Pope John Paul Cultural Center and also contributed to many political campaigns, regardless of party, and to different organizations/causes. He accepted everyone regardless. He was truly an angel, a gift from God, who was selfless in thinking of others first and how he could help them. He was Roman Catholic and worshiped at the Washington National Cathedral, Washington, D.C.
Other survivors include his Godfather and uncle, George Mamera Jr., Old Forge, Pa.; uncle, Thomas Mamera, N.Y.; Godmother and aunt, Shirley Bonacci, Peckville, Pa.; cousins, Jeffrey Mamera, Westport, Conn., and his children, Ethan, Lauren, and Matthew; and Jamie Mamera, Clarks Summit, Pa., and his children, Christian and Chloe; and cousin, Emily Bonacci, Peckville, Pa. The funeral will be Monday at 9 a.m. from the John J. Turko and Sons Funeral Home, 404 Susquehanna Ave., Olyphant, with Mass of Christian Burial at 9:30 in Sacred Heart of Jesus Church, Peckville, to be celebrated by Monsignor Peter Madus, pastor. Interment, St. Michael's Cemetery, Blakely.